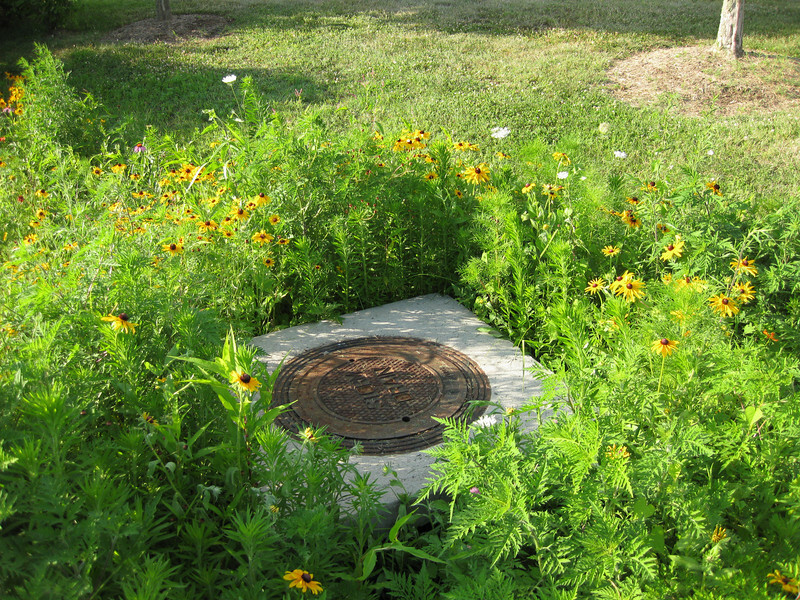 A bioretention swale reduces the speed and peak volume of stormwater runoff, in addition to removing sediment and trace metals, before the water reaches the storm drainage network. The Navy-Marine Corps Memorial Stadium mitigation project of 2002 embodies the holistic approach and visionary potential of Transportation Enhancements to build infrastructure that is integrated with the environment, promotes health, and provides visual amenities. The project combines a 1.25 mile multi-use trail with a series of stormwater best management practices (BMPs) as landscaping. The stadium area serves both as an athletic facility and a park-and-ride location. Now, thanks to a $590,665 TE grant and an even more substantial local match, the stadium parcel is also used on a daily basis by many walkers and cyclists. The project demonstrates an “ecosystem approach” to infrastructure, where one element of the system is seamlessly interconnected with others, and performs multiple functions: preventing flooding, protecting water quality, fighting obesity, providing habitat, and serving the needs of outdoor recreation users. Such infrastructure is characterized both by its efficiency and its livability.